As the weather warms up, light, sparkling, crisp drinks are a favorite around here. Most of our guests turn down the gin if we give them a choice, but they can’t resist a good French 75 or our Tastes Like Pink cocktail — both refreshing and easy cocktails made with gin. Just don’t mention the gin part right away. Pour the first two ingredients in a shaker with ice and shake well. 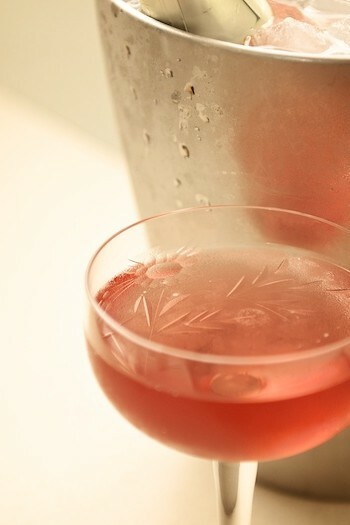 Pour into a cocktail glass and top with sparkling rosé wine or Champagne. Serve with a twist of lemon. Ahh. Champagne Cocktail — an old school tradition! Kir Royale — SO pretty! QUIZ: “Tastes like pink!” is a quote from a popular TV show. Do you know the reference? (No Internet cheating!) Reply below or show off your recall smarts on Facebook or Twitter! Photo copyright GaryAllard.com. All rights reserved. Gin IS the word! love this.